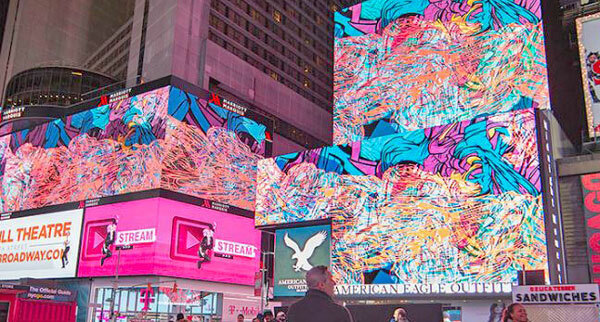 Every night, from 11:57 p.m. to midnight, the electronic billboards at Times Square switch over from advertisements to a synchronized digital art installation. Times Square Arts curates the Midnight Moment displays, selecting a different artist to feature each month. You can read about the current display as well as see images and descriptions of past displays at the Times Square Arts website. The Midnight Moment electronic billboards are at Times Square, 7th Avenue and Broadway, from 46th Street to 47th Street.